I told Deneen a couple days ago that it stinks that in the last two weeks there has been nothing exciting enough to write a blog about. I have tried a couple times to sit down and plod through something, but to no avail. Martin, Lucas, and I have been playing Friday nights at our Fridays at the Museum parties. 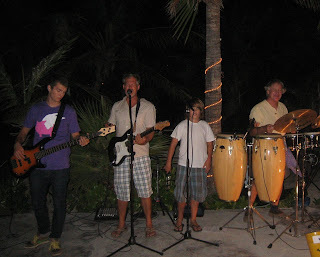 On Wednesday we played a private party for a large group of divers at the Bohio. Last weekend we went diving on Saturday and to the beach most of the day on Sunday. I spent 48 hours wearing nothing but a swimming suit. The biggest thing lately is that we watch the Food Network channel every night and then get really hungry. I don't know if you have ever watched the Ace of Cakes, but this is now one of our favorite shows. I had not even heard of it until Deneen came down in June. The last time I was on Provo I bought several cake mixes and icing. We watch Ace of Cakes and then we try and make cake. Now, we are not making ace of cakes cakes. We are still not to the point where we can consistently make a two-layer cake that cooks even and tastes good. But this week we made a red velvet cake that in one layer we substituted coffee for the 1 1/4 cup water and in the other we put in a little rum cream. The filling layer was strawberry jam and we iced the cake with double chocolate chip. This was the best cake we have made yet. We have eaten it every day for breakfast and dinner. Like the cakes, the game of making Food Network food on Grand Turk is trying to find ingredients on Grand Turk. We decided that if I was on the Next Food Network Star I would have a television show where you found a delicious recipe and then made it with only half the correct ingredients. Yesterday we had rice and bean burritos for dinner. This is the fourth time this we have had burritoes week because J&J got in a bunch of large flour tortillas which you can usually never find here. We bought two large packs. Martin found an Emeril Lagasse recipe for easy enchilada sauce and we decided to kick our rice and beans up a notch. Though Deneen thought the tomato paste tasted old, I think the sauce was quite successful. Cooked up easy and well, tasted better than the same burrito did a couple nights ago. So, nothing too exciting, but that is life lately. Why do you always look like you stepped on sharp rock while you're singing? You are singing aren't you?